Gone Bingo is the product of Isle-Of-Man based gambling company Cozy Games. Established in 2005, Gone Bingo has been around for over 10 years and as such, is one of the most reputable and established brands around. They are part of the industry-leading Best Bingo Network, which is responsible for other popular sites such as Harrys Bingo and the House Of Bingo. It can be argued that over the last 10 years Gone Bingo has had a decent amount of success. They have branded themselves as the “world’s largest bingo room”, however, we are not sure that is the truth, since there are several other more popular sites such as Jackpotjoy and Foxy Bingo. That said, they are established and again, have a great reputation. Their mission statement is to make bingo synonymous with fun and amusement, for that we commend them. There are many different reviews of Gone Bingo. Each one of them gives you access to the £15 free no deposit required bonus and tells you how to get started with the company. Creating your account is pretty simple, there are “register” and “join now” buttons all over the site, simple click one, fill out the registration form and away you go. In order to get the £15 no deposit bonus, you need to put in card details, which is pretty much the norm nowadays. Once you have registered, getting access to all the games is easy, simply navigate through the lobby and select which bingo game or slots game you fancy playing. Bingo game options are vast, you will be able to play from as little as 1p and take part in many different game variations. There are pre-buy games too, simply click “pre-buy” and away you go. Game variations include standard games such as 90 and 75 ball bingo, to speed bingo games such as 30 ball bingo. With your bonus bucks (BB’s) you will be able to play bingo games and selected slots. You will not be able to access some games on the site. When it comes to depositing and withdrawing cash, make sure you read the terms and conditions, as well as wagering requirements. These are subject to change, so make sure you check them out. Deposit methods include most credit and debit cards, as well as Neteller, Skrill and PaySafeCard. There is also Live Chat support, so if you get into any difficulties, simply click the live chat button and talk to an advisor 24 hours a day. 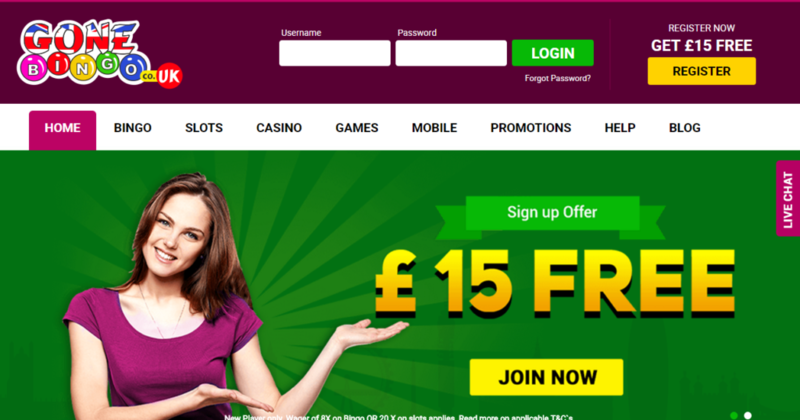 £15 free no deposit required. £40 bonus when you deposit £10. Deposit specials: get up to 450% extra on large deposits. Gone Bingo works great on all mobile devices, including smartphone and tablet. Simply use the login form from your compatible device and you will be able to start playing bingo games and slots on the go instantly. Simply use coupon code MOBILE100 and you will receive 100% extra on your next deposit. This deal is exclusive for Great Britain Bingo players, who deposit using their mobile phone or tablet. Gone Bingo is a truly established brand with a great reputation. They also allow you to start playing free bingo online without spending any money. If you get lucky enough you will be able to win some great real money prizes without risking a penny. What’s not to love? Make sure you check out the official sites T&C’s as well as wagering requirements before you make a deposit. Enjoy!